An innovative project in Ethiopia is helping children overcome barriers to enter primary school and reach their full potential. Smile! 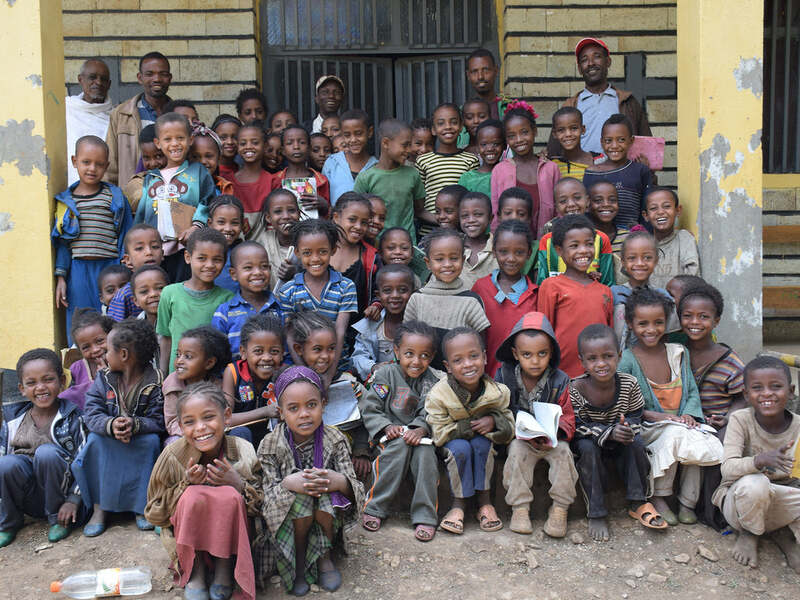 It’s class photo time for the children at this pre-school in Damboya district, Ethiopia. Their pre-school is part of a 10-year project run by TEAR’s partner the Ethiopian Kale Heywet Church (EKHC), designed to reduce the barriers to children entering the education system. Children who want to enter the government primary school system in Ethiopia need a basic level of literacy, which excludes many of those who are poor and marginalised, especially in rural areas. EKHC’s Child Literacy Project provides a pre-school education for these children, equipping them with basic literacy and numeracy to enter the government school system. It works through local churches which recruit volunteers, who are then trained as education facilitators. The whole community is involved – from parents to community leaders. All community members are welcome to attend, regardless of religion. The Ethiopian Kale Heywet Church (EKHC) is a long-term TEAR partner in Ethiopia. Kale Heywet means “Word of Life”. EKHC has been working for nearly 10 years on an education project designed to reduce the barriers to children entering the education system. Ethiopia is the second most populous country in Sub-Saharan Africa, with the population amounting to 92 million. Poverty is widespread in Ethiopia, with 30% living on less than $1.25 a day and the country ranks 173rd out of 187 countries in the UNDP Human Development Index. TEAR Australia has long-term relationships with partners in Ethiopia and the Child Focused Basic Literacy and Numeracy Project is now in its 11th year. Choose from aor Default Title.